Local officials and community members attended the event and learned about the plans to reinvigorate the shopping center. Updates will include entertainment space, community areas with group games including a bocce ball and giant chess pieces, charging stations, increased al-fresco dining, art installations with enhanced lighting and water/fire features, an updated logo, refreshed Spanish tile steps near the Arts Terrace, drought-tolerant landscaping, and new "shopping experiences." The project is expected to be finished by early 2020. The LEED-certified shopping center is located in the heart of downtown Santa Barbara on State Street between Ortega and Canon Perdido. It opened in 1990 as part of a private-public partnership with the Santa Barbara’s Redevelopment Agency and features 154,900 square feet of retailers and restaurants. Paseo Nuevo Management, Pacific Retail Capital Partners (PRCP) and J.P. Morgan Asset Management (JPM), announced the renovations this past February. 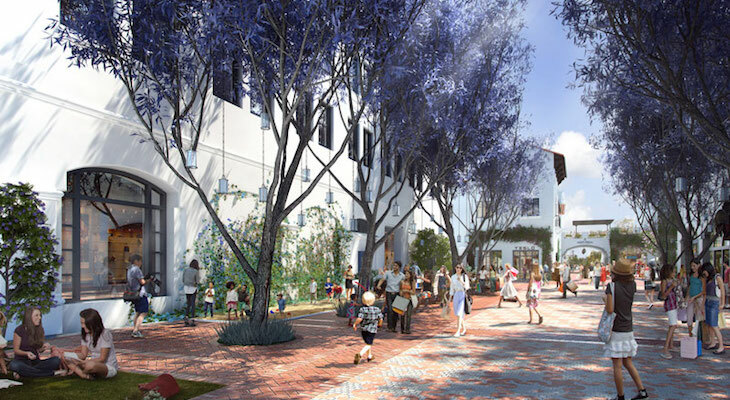 In November, the City of Santa Barbara’s Historic Landmark Commission (HLC) voted unanimously to approve Paseo Nuevo’s renovation plans, allowing PRCP to launch an exterior refresh of the 458,000 square foot property. The improvements to Paseo Nuevo will provide upgrades to exterior facades, walkways, and landscapes, which are described to "enhance the Santa Barbara experience while maintaining the unique authenticity of the city’s culture, lifestyle, and Spanish heritage," according to a Paseo Nuevo press release. “Paseo Nuevo’s location in the heart of downtown, its beautiful architectural representation of Santa Barbara and the outdoor lifestyle it reflects of its community, is why Paseo Nuevo is the crown jewel of the Pacific Retail portfolio.” said Najla Kayyem, Senior Vice President, Pacific Retail Capital Partners. This first phase of redevelopment will include revamping specific areas of the center, creating districts within the Paseo Nuevo footprint, and working closely with the Santa Barbara County Office of Arts & Culture to implement a dynamic art program. This art program will commission local artists through permanent installation opportunities, with $200,000 being allocated toward the initiative. Paseo Nuevo Management has also committed an additional $200,000 to identify supportive solutions for Santa Barbara’s homeless population. The newly appointed Ortega Building, previously home to Macy’s, will be repurposed in the next phase of the ongoing reinvestment into the larger Paseo Nuevo property by its ownership, according to the press release. Planning for the integration of the Ortega Building will happen over time with consideration from community input and policymakers, starting with an online survey available at surveymonkey.com/r/PaseoNuevo. The plan is to transform the former department store into a vibrant complex supporting community and commerce. I think the city lots should extend their free parking to 2 or 2.5 hours. People may come downtown to have lunch and stay a bit longer. Did you notice that there was no mention for the $20 million funding? It's our tax dollars being abused for a private enterprise. Impeach all the city council members who voted for this ridiculous expenditure. I noticed that there was in fact mention of the funding............actually several times. Rather than listing them all lets just say that there are no tax dollars being abused . Hint, Paseo Nuevo Management et al. Would be nice to see the names of the designers and architects in articles such as this. A little public accountability goes a long way. He'd say "You got any spare change?" Last time I visited State was to pick something up at a local store (Salt), and as I walked down DLG from the lot it smelled of urine so bad, it was gross. And we walk on that, goodness knows what diseases people could have from lack of med care, poor health, IV drug use, you name it. I was dreading walking back. Nasty. Why is police patrol on State Street so uneven? And, the volunteers to patrol, there one day, not there many more days. Who is organizing this. Do a __better__job. @888.. Hey, I'm "homeless" too! Please don't send us to the islands..I have no desire to be "Lord-of-the-fleas"...lol. Wow, just looking at the photos, not much of a change, but wait first they remove or fill in the fountains and now they’re going to make new ones, yep waste of money, Maybe cleaning those dirty dirty streets, and yes I do see more homeless there,occupying those closed store fronts and they are filthy. Yes the greedy owners and the high rents. I do go to state street to shop and dine, and feel kinda scared when I see so many homeless there and a lot of them with pit bull dogs and they are off leash, I understand why they have the dogs, poor dogs. Its making it feel unsafe for shoppers and tourists or for anyone to go down there especially at night. Could they make a shelter for them not so near the hub of town? Does anyone know if the city reads any of this? A little humor: Turn the former Macy's into a homeless shelter. Just joking: They'd have to add at least another restroom. <G>--still joking, although neither issue is funny. A laugh to keep from crying response. Yea that’s the answer! Make it even more expensive to shop there. Can’t wait for an even fancier looking mall with no stores. As an elderly person I walk through downtown often and yes there are homeless and/or odd seeming characters, but in the big picture the environment doesn't seem threatening to me. Just one opinion here. $20 million would go a long way to solving the homeless solution in downtown SB if put in the appropriate hands (shelters, mental healthcare, and staff). This money is making the place nicer for the homeless people to camp out. I, too, will not go near downtown because of the homeless and the gangs. It’s just not worth it. If I can’t get it in Goleta, I’ll shop online or out of town. My dollars will be spent elsewhere which INCLUDES my tax dollars. Hear that city council? I doubt very much they care. They certainly have done nothing to clean up downtown as it has only gotten worse. City council needs to care about all the downtown negatives. Loss of retail sales taxes makes it harder to balance the city budget that supports employee compensation packages and their ever increasing city employee pension payments. City staff needs to care a lot more too - they are the direct beneficiaries of all city tax revenue streams from all sources; not just our property taxes. It's not just the actual gang or street-person activity, it's also the awareness of the possibility of getting involuntarily part of an incident. Sleazy and an unnecessary burden to enjoy our downtown, shop or go to an event. How sad - and dishonest. this is a ploy to dupe more tourists into spending their hard earned money to come here, all excited, only to be tricked by the real truth of downtown SB once they get here. I feel it is so misleading! It especially angers me when i see elderly tourists who probably had no idea. People (locals) should start commenting on places like Yelp, Trip Advisor, Kayak, any and all online sources for tourists to read about "vacation destinations" about the truth of DT SB, despite the pretty pictures. Then maybe city council would wake up! Of course they do!?! What are you talking about? People love to go shopping when they come here - or anywhere for that matter. Have you BEEN to State Street on a weekend, or even during the week, especially during the summer? Mostly tourists. Whenever my family /friends come they always want to at least go for a stroll one day or night. You must not live here. Cruise ship passengers are also surprised at the city street degradation they encounter, since a big activity is walking from Sea Landing where they get off and then up the length of State Street. That has become a very unpleasant gauntlet since they pass lower State Street in order to get to Paseo Nuevo and the Courthouse. Either by shuttles or walking. That will happen. Just as it takes time to gain a good reputation, it takes time to lose that reputation and that will linger even if the problem is addressed. Did people EVER come to SB for State Street? I highly doubt it. Perhaps the beach, pier, boating, hikes, gardens, mission etc. State street while having gone downhill has never been amazing enough to travel to, imho. This mall could of been so much better if Caruso would still have an interest in it. Unfortunately the city council keeps pondering why the only housing being built under incentive is 1.5x over median income level of santa barbara occupations. Had Caruso still been involved and the city was actually interested in changing policy, they would of re-zoned the entire downtown to allow housing and people could be living/working/spending money directly within this mall. Too much stress for me to spend my money on State Street. I am afraid to go there. Haven't to be Paseo Nuevo in more than 10 years. No plans to visit until things are cleaned up. Not a pleasant place to dodge skate boards & bicycles on the sidewalk or having a homeless person request or demand money from me every other block. Not only that but those faster-than-pedestrian-speed things can knock down old people who never can recover their full mobility. Those who whiz by don't bear the full cost of their action even if apprehended. No offense, but I think they should give the 20 Million to Caruso and have him revamp the space. That does not look like a 20 Million renovation. That looks like a 1 million facelift with some fingers crossed. And another one that can't even read.................It's 20 million and 200k for the homeless. plus 3 likes for a total 4 that can't be bothered to know what they are talking about. It's $200K, not 20 million. Still, wasted resources. Too bad some of you don't know what it's like. Forget bus tickets (for homeless problem); how about a boat ride to Anacapa Island? They can live outside. Meals can be delivered. I'm always in favor of outdoor dining spots, if done right. A bocce ball court is an interesting idea. And what do they plan to do with the Macy's building? I'd like to see moderately priced condos above ground floor shops. As long as a private investor is paying, I'm happy to see them make these changes. Moderately priced condos in a prime area like that? That's delusional! Even in lovely downtown Cleveland it would never happen. Wealthy retirees are snappingup the convenience/availability of center-of-city living. Look at the prices of condos already built downtown. What is a "moderately priced" condo? How would they add windows and balconies to make the Macy's space liveable. So they are going to pretty up the benches and fountains just so the homeless are more comfortable? I won't sit on any bench DT and I tell visitors not to either b/c of the homeless problem. Just more comfortable/nice places for them to squat and ruin. Paseo Nuevo is private property - they can control who enters their property; unlike public property streets and sidewalks which the city refuses to control. I'll continue to stay away until they get rid of the homeless that are squatting on State Street. Personally I don't care what they do to that mall, until they clean up State St./Downtown as a whole. I will say that it seems like a whole lot of wasted money though! Idiots. It's the landlords who drove out businesses on State Street; the vacancies simply allowed for panhandlers to get nice and cozy outside those shuttered doors without interference from local shopkeepers. This isn't rocket science, SB. Put a check on greedy commercial landlords, make yourselves a little more small-business-friendly, and voila! Watch the "revitalization" happen all by itself. 20 mill sure doesn't go as far as it used to. REALBEBE why do you keep erroneously correcting people? It's 20 MILLION, with 2 items of $200K one for art installation and other for "homeless problems". Why do you keep erroneously correcting people? Have you read the article? Isn't this more just "putting lipstick on a pig?" The downtown is DEAD until the CITY gets rid of the homeless, the public urinators, the in-your-face panhandlers, and stratospheric high rents so merchandise isn't out of reach for the non-millionaires who would like to shop local vs online or at Costco. Duh, last time I checked it... was the homeless driving business away. The only problems I've heard of with the boys and girls are the 1/2 day Friday gang fights and as opposed to the homeless they are usually run out of there pretty quickly.